Excuse my lack of modesty, but I’ve seriously outdone myself with this dessert parfait. It is absolutely to DIE FOR! Perfectly creamy and sweet with a little crunch from the cashew crumble! Even Tim, who is not into sweets, couldn’t wait for me to finish photographing these little babies so he could dig in. Oh yeah, friends! When a dessert has the husband seal of approval in this household, you can bet it is something exceptional. 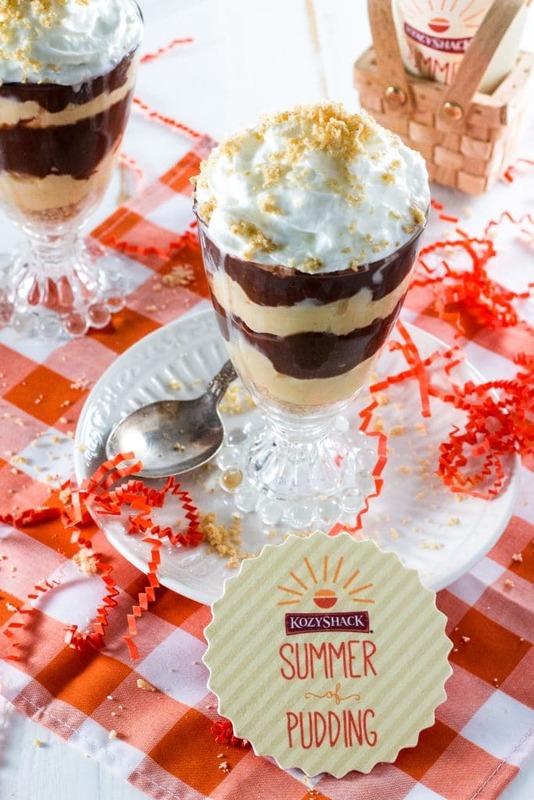 As much as I’m a happy camper if I have a spoon and a container of Kozy Shack‘s pudding by itself, I wanted to create an elaborated summer recipe that I could serve at my next dinner party! 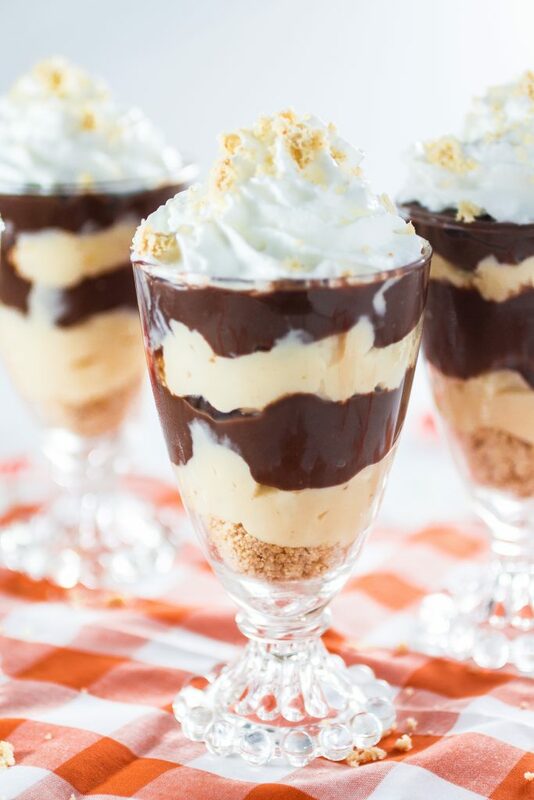 So I drew inspiration from one of my favorite desserts – my grandmother’s Brazilian Pavê (which is like the Brazilian version of tiramisú) – and created these little Dessert Parfaits that uses that same type of cream, because what goes better with chocolate pudding than a decadent cream? And then I had the brilliant idea to top it all off with whipped cream and some cashew crumble. What is cashew crumble? It’s the name I gave to this new creation of mine: I processed some lady fingers cookies, powdered milk, sugar, butter and, of course, lots of cashews! Seriously, I could eat that stuff by the spoonful. Good thing the recipe makes more than enough, so you will have some extra that you can store in an airtight container and use as a topping for ice cream, milkshakes and even on yogurt for breakfast! But don’t get fooled by how amazing the cream and the cashew crumble are in this recipe. 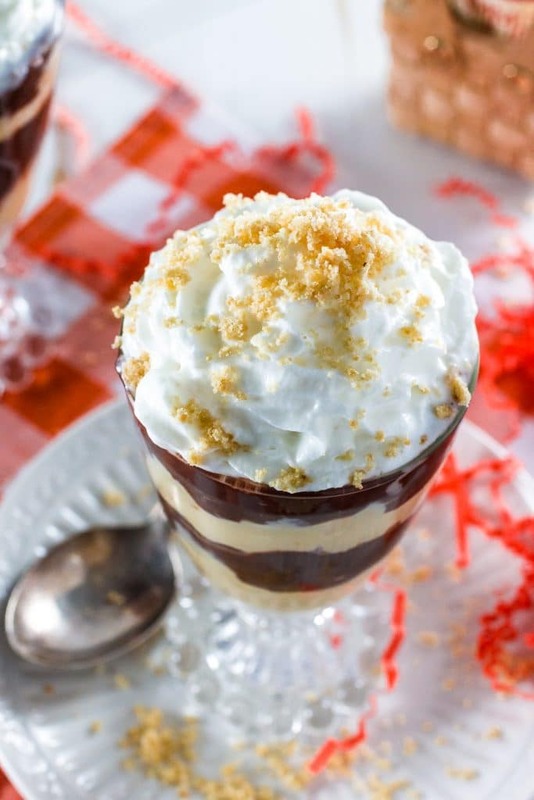 The real star of this dessert parfait is the chocolate pudding. Kozy Shack‘s pudding is made with simple, wholesome ingredients, so it’s simply delicious. It is the only premium pudding made with simple, wholesome ingredients like milk, eggs, and sugar. The chocolate pudding is so rich and chocolatey, and it is made with real cocoa! Funny thing: just by writing about their pudding made me drool, so I had to stop everything and run to the kitchen to get me some. Best – midnight – snack – EVER! I’m in deep crazy love with individual desserts served in glasses. Not only they look adorable and sophisticated, they also make your guests feel extra special. They think you worked extra hard on something just for them! But the thing is… you didn’t! Because this recipe is a breeze! Ok, there’s a little work involved in making the cream, but I promise it is worth it! Also, you can make everything ahead of time and just assemble before serving. Cause then you don’t have to chill the glasses for an hour, since everything is already cold… Ooor you can even assemble the glasses the night before and just leave the whipped cream to add right before serving! You know what makes ME happy. (Hint: PUDDING!). For some more Pudding inspiration, check Kozy Shack’s Facebook and Instagram pages! They will be giving PRIZES all summer long! After all, it is the #SummerofPudding! In a saucepan, combine the sweet condensed milk and 1.5 cups of milk. Use the other 1/2 cup of milk to dissolve the corn starch and mix it with the rest. Cook, over medium low heat, until it starts to thicken. Separate a cup of that mixture and let it cool so you can add the yolks. Don't add the yolks while the milk mixture is still hot, or you will have scrambled eggs! Also, make sure you strain the yolks so you get rid of that "yolky" taste. Return the milk mixture with the added yolks to the pot and continue cooking until it is thick like a cream. Reserve. Process the cookies, cashews, powdered milk and sugar in a food processor until finely crumbled. Add the melted butter and pulse a few times to incorporate. Add a layer of cashew crumble to the bottom of each glass. Proceed with a layer of cream, a layer of chocolate pudding, another layer of cream and another layer of chocolate pudding. Chill for at least one hour or overnight. When ready to serve, top all the glasses with whipped cream and sprinkle some more cashew crumble. This recipe makes way more Cashew Crumble than you will need for the parfaits. Store the leftovers in an airtight container in the fridge for up to 2 weeks. Use as a topping for ice cream, frozen yogurt, milkshakes or even as a topping for your yogurt in the morning. This parfait is such a treat, perfect for cooling you off. I love the cashew crumble topping. I love how sweet and creamy this parfait looks! I can imagine that this dessert will be a real winner in our house! Thanks for sharing!! Your cashew crumble is delicious! It makes all the difference in this recipe, congrats! I love pudding parfaits- I can eat way too many, lol. I buy Kozy Shack all the time- this will be on the dessert menu soon- and definitely with that cashew crumble!